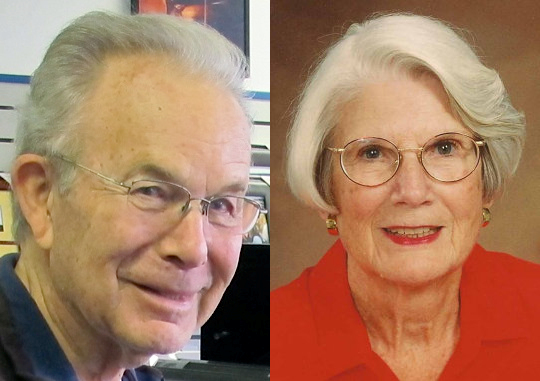 Orange County recently lost two more excellent local historians: Don Tryon of San Juan Capistrano and Juanita Lovret of Tustin. "It is with regret and sadness that [I] report Juanita Lovret’s passing recently at age 92. "Juanita lived in the Tustin area her entire life, taught at Tustin High, was Tustin Woman of the Year in 1996 and was very active in the Tustin Area Historical Society. Juanita also wrote a weekly column ["Remember When"] in the Tustin News for many years and wrote two books about Tustin history. "Details about a public memorial gathering will be forthcoming. The family has asked that in lieu of flowers, donations be made to the [Tustin Area] Historical Society in Juanita’s memory. The family has also asked for people who knew her to send letters or cards to them describing their favorite memories of Juanita. These cards and letters can be mailed to: Remembering Juanita Lovret – c/o 13711 Yorba Street – North Tustin CA 92705." "Don [Tryon] was born and lived most of his life in California, working primarily in the oil industry and raising a family. In retirement, he and his late wife, Mary Tryon, moved to San Juan Capistrano where they became active with the Historical Society, Mission Archeological team, and Fiesta Association. From about 1990-2015, Don was the Archivist for the Historical Society, preserving the photographic legacy of San Juan Capistrano. During his tenure, the collection grew to over 9,000 photos. Don also served as a Cultural Heritage Commissioner, served on the County Historic Commission, was a Kiwanis; a longtime Chamber of Commerce member, and was a writer of historic facts and stories for various local newspapers. Don was selected as the San Juan Capistrano Chamber of Commerce 1999 Man of the Year and was commended in 2000 by the California Legislature for his exemplary record of civic leadership. Don is survived by his wife since 2009, Penny, by his children Gail and Michael, and four grandchildren. [Ed - He was also married to Mary Ellen Tryon for 58 years until her death in 2008.] In lieu of flowers, donations may be made to the San Juan Historical Society Building Fund, https://sjchistoricalsociety.com." Goodbye to two more of the good ones.